Light up your home with these new twists on the traditional. From rustic elegance to a fun kids Hanukkah craft, we’re sure you’ll find a menorah here to suit your style. Find nine clear bottles and thin taper candles. 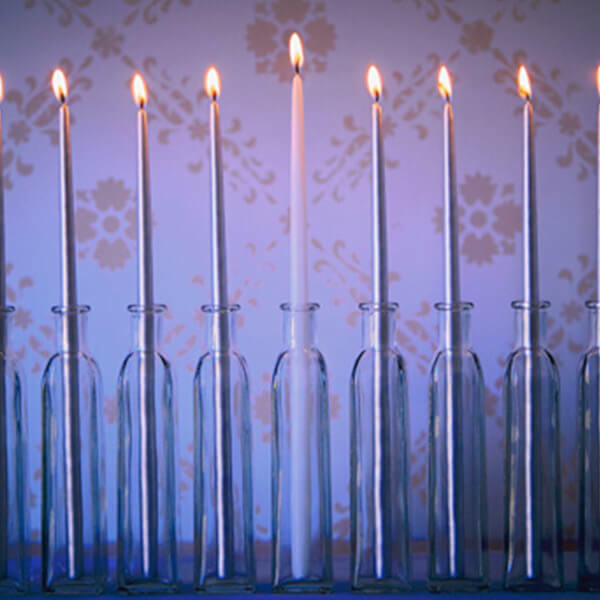 Use eight silver candles on either side of the one taller ivory or white candle for the center shamash (attendant) candle used to light the other eight candles. 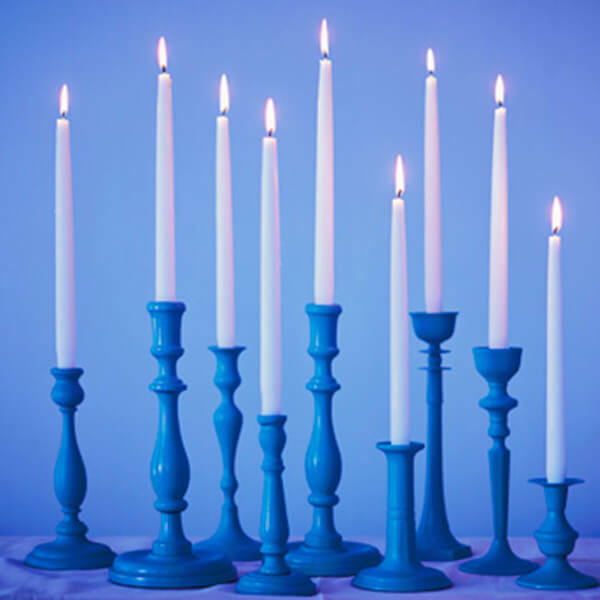 Here’s a fun idea—gather nine wooden candlesticks of varying heights and sizes, and paint them all one shade of blue. 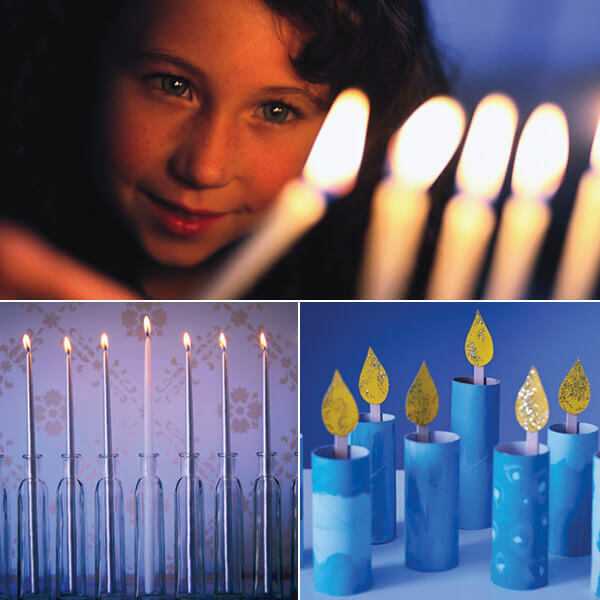 Then, add your candles, saving the tallest for the shamash candle at the center of the menorah. 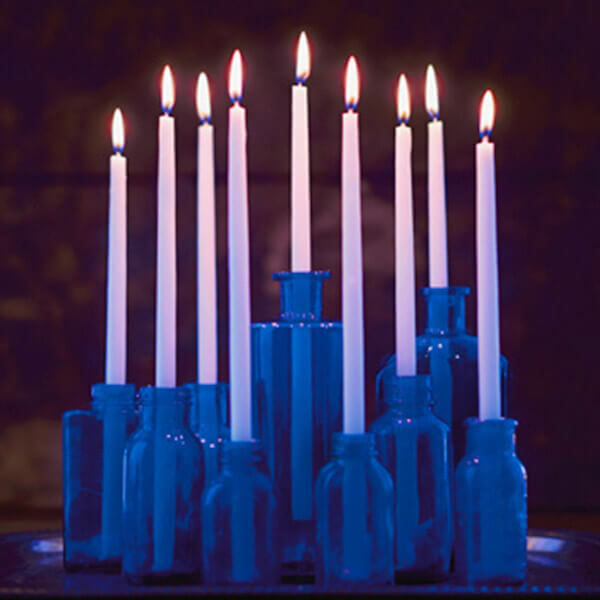 Use your collection of blue glass bottles and an old silver tray for this simple menorah. Don’t worry about matching the bottle colors perfectly. The varying tones and shades of your bottles will complement one other when you group them all together. Add taper candles thin enough to fit the openings of the bottles. Place them on the silver tray in an arc shape with the tallest candle in the center. Have fun creating this craft menorah with your kids. Save eight toilet paper rolls and one paper towel roll for this project. 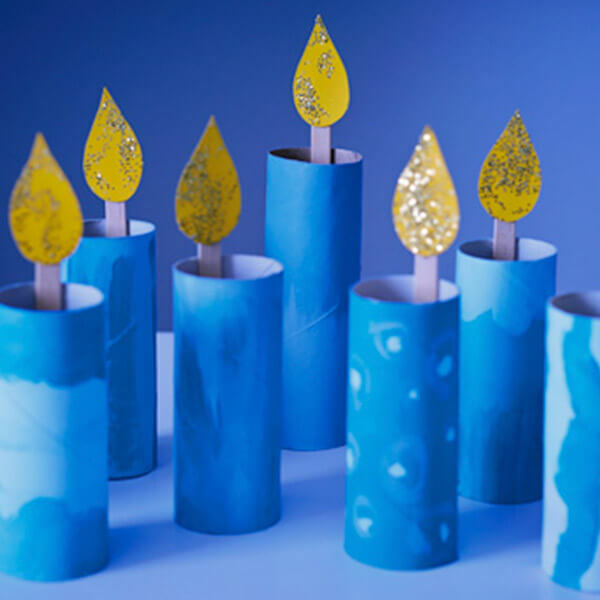 Clean off any bits of paper from all the rolls and paint them in two shades of blue craft paint. When dry, cut the paper towel roll in half to represent the center shamash candle. Now, gather craft sticks and yellow construction paper or card stock that has been painted yellow. Cut the paper into teardrop shapes to make the flames. Add glitter for sparkle. Glue the teardrop flames to the ends of the craft sticks. Each night as you “light” the menorah, place each stick in the center of each roll.